B&B! 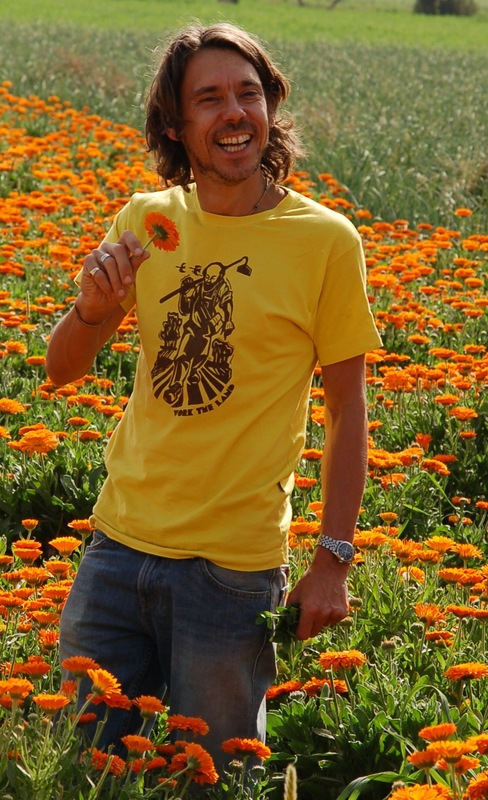 Q&A: Sebastian Pole and Pukka Ayurveda | Bright & Beautyfull! Way back in April of 2012, I came across some press info about Pukka Ayurveda, and its founder, Sebastian Pole. I ended up taking a quiz on their website that informed me of my dosha, the designation of which would then inform me as to how to improve my life. A lifelong taker-of-quizzes-in-magazines, I wasn’t surprised by the result, but I was intrigued by the resulting tumble down the ayurveda rabbit hole. The Hindu system of medicine is ‘deals with physical health, mental balance, spiritual well-being, relationships and environmental issues’, as described on the jacket of Pole’s 2011 book, A Pukka Life. There’s natural, and then there’s organic: could you talk about how Pukka Ayurveda is an industry leader in the latter? The organic movement is our religion and we pray at the altar of the compost heap! Organic stands for sustainability. You put back in what you take out. You regenerate the soil that feeds you and your family. You try and improve what you have been given. The principles of organic farming are also embodied within the essence of Ayurveda. They support and nourish the health of the whole: air, sun, water, soil are all equally interdependent in the well-being of our ecosystem and society. Respect for the billions of microorganisms in the soil is as important as practising the highest animal welfare standards. Nurturing wildlife is as important as not spraying toxic chemicals. Organic farming really does stand for life. One of the best ways to tell that a farm is really organic is by the amount of ‘weeds’ that you can see. Weeds are an indication of the health of the ecosystem: attracting insects, raising nutrients from the deeper layers of soil. Of course weeds are often healthy herbs themselves, just think of dandelions! Can you talk about how you have created a sustainable community for your growers, and by extension, for the brand? Realising that we could contribute to conservation through commerce was a light bulb moment for us. It seemed clear that if nature has more value ‘alive’ than ‘dead’ then we will protect her. And rather idealistically — from our spare bedroom in Bristol — this is what we wanted to do with Pukka. We saw a society in need of a deeper connection with nature, and communities seeking a more natural life. It was something we craved ourselves, and realised that it was something many other people wanted too. Our dream was to create a pukka-quality company that would bring people and plants together. Our passion for health, for nature and for the wisdom of Ayurveda was the catalyst for founding Pukka Herbs and it still is today. Through making organic Ayurvedic products we could bring some value to these threatened forests. By paying farmers and collectors above market prices for the herbs we use at Pukka we could help protect the dwindling eco-systems. By making organic farming practices worth more than soil-destroying conventional methods we could incentivise conservation of the earth. Commerce could lead to conservation. I think that many people may be glancingly acquainted with the principles of Ayurveda – could you explain its essentials for us? Ayurveda is amazing. It’s India’s ancient system of health, and yet so much more. It’s a way to live and a way to understand and transform your life. It is often translated as ‘knowledge of life’ and encompasses the idea of how to live wisely. In particular it is the knowledge of how to live according to your unique and individual constitutional make up that puts the choices of how you exist firmly in your court. At its core, Ayurveda teaches respect for nature and an appreciation of life, by showing how we can empower ourselves as individuals. It understands that our individual health cannot be considered as separate from anyone else’s — from our family, work, society and planet’s health. It describes in intricate detail how you can fulfil your potential. What could be a better guide for us to have at the centre of Pukka’s values? The wisdom of Ayurveda is an anytime, anywhere, anyone sort of wisdom. It is expressed as a way of life that flows with the changes of the seasons, weather, time and place. It teaches dietary and behavioural adjustments that can be adopted as you mature from childhood through to adulthood and into old age. It also gives advice on how to prevent illness as one season becomes another, and specific recommendations on how to adjust your daily habits. This way of wholesome living prescribes a routine for all the different climates and geographical regions of the world. At the root of Ayurveda is its focus on the uniqueness of each individual. As such it is a universal system applicable to every individual living in any part of the world. It is personal medicine at its best. I don’t like toners, but I love the Uplifting Toner. I love to moisturise, and I have been using the Deep Moisture Day Cream to great effect. What’s particularly special about both? What is particularly special about these two products, as well as our whole skincare collection, is two main things: the excellence of the ingredients and the brilliance of Ayurveda at rejuvenating the skin. The Uplifting Toner is 100% organic and like all of our skincare products is certified by the Soil Association. It firms, uplifts, repairs and encourages cell renewal. It’s also anti-inflammatory, anti-microbial, and the toning and soothing effects are all due to the benefits of the delicate flower waters and plant extracts. The Deep Moisture Day cream contains premium pressed seed oils and butters with a superior fatty acid profile to hydrate and enhance absorption deep into the skin. Skin active anti-aging plant extracts are used to target mature, dehydrated skin whilst also nurturing, deeply hydrating and restoring. The exotic, sweet scent of ylang ylang and uplifting and regenerating neroli blossom immediately lift your spirits. I’ve tried the teas, too! The Pukka ethos seems to be holistic, and health as an inside-and-out proposition seems to be a big part of it. Can you talk about we can actually find better balance in life? A simple way to find a more balanced life is to learn more about Ayurveda. It contains many insights into wise living. I realised in my early twenties that there is no difference between our health on the inside and that of the world around us. Working towards a deeper awareness of each helps to nourish the whole of your life. The best thing to do is to make sure that you spend as much of your life as possible doing what you love and being surrounded by people that you respect and enjoy being with. See pukkaherbs.com to take that quiz! Specific info re: skincare can be found at pukkaherbs.com/skincare. A Pukka Life by Sebastian Pole is available where good books are sold.